In order to withstand the sun, wind and rain, outdoor fabrics are made from entirely different fibres and with different finishes to standard furnishing fabrics. Without these extra steps, standard fabrics will deteriorate, fade and mildew in short order as anyone who’s ever accidentally left an indoor furniture piece outside can attest. While most fabrics are produced from yard that has been dyed and woven, solution-dyed acrylics are made from a process whereby a liquid acrylic solution is mixed with the dye and the fibre is made colour-fast and water resistant before being spin into yarn. Acrylic is a fabulously versatile base for outdoor fabric due to its durability and resistence to fading, wrinkling and mildew. When combined with polyester which is dipped into an acrylic coating, the result is a hard-wearing fabric ideal for use in boat and car protectors as well as umbrellas and awnings. Olefin is a man-made fibre that is also referred to as polyethylene or polypropylene depending on its structure. The fabric often has a smooth texture and is usually solution-dyed, making it quick to dry and resistant to weathering. Outdoor fabrics are not exclusively used on outdoor furniture. We are tending to use outdoor fabrics on any furniture that suffers from constant sun exposure, which is an increasing scenario with the current architecture style of large picture windows and limited window coverings. We also have many ranges of outdoor sheers, suitable for curtaining the pool house or patio. These are really effective in providing the resort look and come in a variety of patterns and textures. Fabric houses are realizing the potential for outdoor fabrics and have increased the range of designs enormously. Plains and stripes are now overtaken by small patterns, geometrics, florals and ikats. 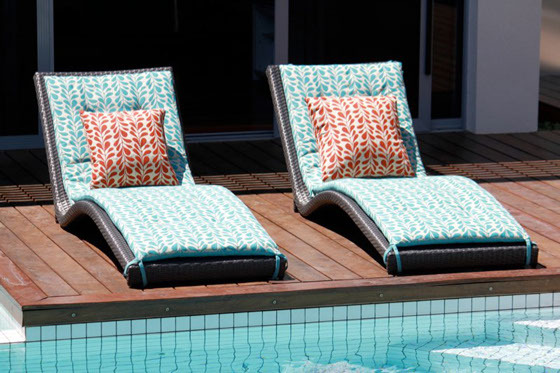 With summer on the horizon, call in to see out extensive ranges of outdoor fabrics this season.